A mid-grade single-stage snowblower offers greater clearing width, larger tires, and a bigger frame. In some cases, mid-grades offer easier steering, upgraded chute options, and a bigger impeller for faster snow blowing. We recommend spending a little extra time shopping for the perfect single stage. Here are a few features that you should consider. 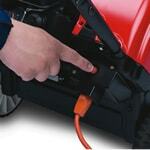 Snowblowers with recoil start are similar to lawn mowers in that you have to pull a cord to start them. If you still have nightmares about pull-starting small engines, then you might want an electric start snowblower. Chute styles differ quite a bit between entry-level and mid-grade snow blowers. 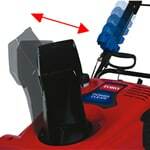 As you upgrade from entry-level to mid-grade, you find more convenient chute options that make snow blowing a breeze. The smoke-belching, two-cycle snow blowers from your childhood are as dead as dial-up internet service. 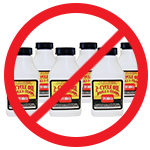 Modern four-cycle snow blowers no longer require mixing the perfect concoction of gas and oil. You simply add gas to the gas tank and oil into the engine just like your lawn mower. Mid-Grade Single-Stage Buying Guide - Find Out How to Pick the Perfect Mid-Grade Single-Stage Snowblower. Our snowblower how-to library can help you pick the perfect single-stage snowblower, two-stage snowblower or snow blower accessory.